Wanting to jump into poetry? Wanting to get your grade level or maybe your entire school to dig in to some well written poetry? This resource was created as a way for an elementary school, K-5 to experience poetry together. This resource is based on the Vertical Alignment of TEKS for poetry, K-5. Want to get your students engaged in finding figurative language? 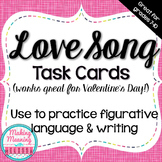 Try these task cards that use lyrics from popular love songs! Each of these 40 task cards included an excerpt of a popular love song (from many genres - pop, country, rock, etc.). In the lyrics is an example of figurative language. 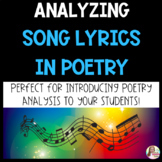 Song Lyric Poetry Analysis: "Love Song"
Students will analyze each stanza of "Love Song" by Sara Bareilles and complete an analysis for each stanza for figurative language, sound devices, etc. At the end, students will compose a written analysis of the song lyrics. Sample answer key is included. The student will write a lyric poem based on a childhood memory. Directions for the poem plus the grading rubric are included. Analyzing Lyrical Poetry With Music "Titanium"
This test consists of 20 lyrics taken from popular music. The student must identify whether the lyric is an example of alliteration, repetition, personification, hyperbole, simile, metaphor, or onomatopoeia. This sheet took me a significant amount of time to make, and my students love it. This PPT teaches lyric poetry through two poems, in particular, "Winter Dark" and "The Sky is as Vast as the World," focusing on imagery, tone, mood, analogies, rhyme scheme, etc. 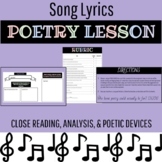 This lesson plan includes fun and exciting ways to learn about Lyric poetry and then gives the students to create a poem on their own! The powerpoint can be created by anyone however if you would like purchase the one i used please contact me so i can send you the link. 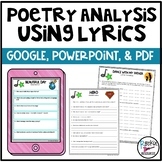 Use modern day song lyrics to engage students and help them identify literary terms and challenge their analytical skills! This song includes questions and the lyrics of the 2018 LII theme song, "The Champion" with Carrie Underwood and Ludacris. It focuses on the lyrical poetry, poetic devices and annotating the lyrics. This quiz consists of song lyrics taken from popular songs. The students must match the lyric to the poetic device it represents. There are three matching sections with 5 lyrics per section. I will also be posting an additional quiz and a test also that use song lyrics. 17th Century Lyric Poetry Lesson - John Donne's "The Flea"